The third week of Advent is our Festival of Animals, a selection of our handmade animals joined the trees seeds and stones on our seasonal table, like last week it was a truncated version of what I had planned. The week started with St Lucia's Day. St Lucia is a patron saint of Light and gives her name to a festival of light that is mostly celebrated in Sweden. How this came to be a significant festival is not known but I remember celebrating it at school as a child. Given the darkness of Winter particularly in Sweden it is unsurprising that such a festival should be celebrated at this time of year. We made lussikatter in the morning which we ate with a hot drink, next to the fire, whilst sharing our St Lucia story. We restarted our tea ritual this week whilst we listened to our stories each day. The chapter from the Reg Down book, some more Scottish Folk Tales, and many poems about animals. We also started to read a lovely book The Snow Bear by Holly Webb which we will continue into next week (it also ties in nicely with next weeks theme too). This is a charming winter story if you are looking for books for the season which are not Christmas orientated. It stands alone as a lovely book or could be used as the basis for many projects, including the Artic, the people and animals that live there, igloos, snow (and different types of snow) and I am sure there are many more! The Reg Down story for this Festival includes Angels so we thought the ones we made last year should make an appearance on the seasonal table. Alice and I had a go at making one from this book it was a little fiddly for small hands. She is hanging from the plant above the seasonal table and being so light (she is made from tissue paper) she wafts around in the air constantly, in a rather lovely manner. We feed the birds all year round on our bird table, for most of the year we put out scraps of food, in the Winter we like to make the bird food we put out, we have two recipes. For seed eaters, a block of lard melted with sunflower seeds, peanuts and breadcrumbs mixed in (you could add other seeds from bird seed mixes too). For insect eaters, a block of lard melted with meat scraps, grated cheese, oats and sultanas mixed in. We leave the mixture to set in a bowl and then tip them out where the birds can feed on them safely. You could also pack the food in between the scales of fir cone and hang that up. It doesn't last long! We added a charming felted robin to our wee tree, gifted to Alice by a kind friend as a get well present. Next week is the Festival of Humankind and the Winter Solstice. I have never heard of these festivals they seem like a good way to celebrate advent. Awww, that's such a cute robin. I love how you celebrate these festivals, the festival of animals is definitely one which would appeal to me. I just love reading about your family traditions. Your animals are adorable, as are the angels and birds. I love seeing what other families do to celebrate the holidays because there are just so many interesting ways. 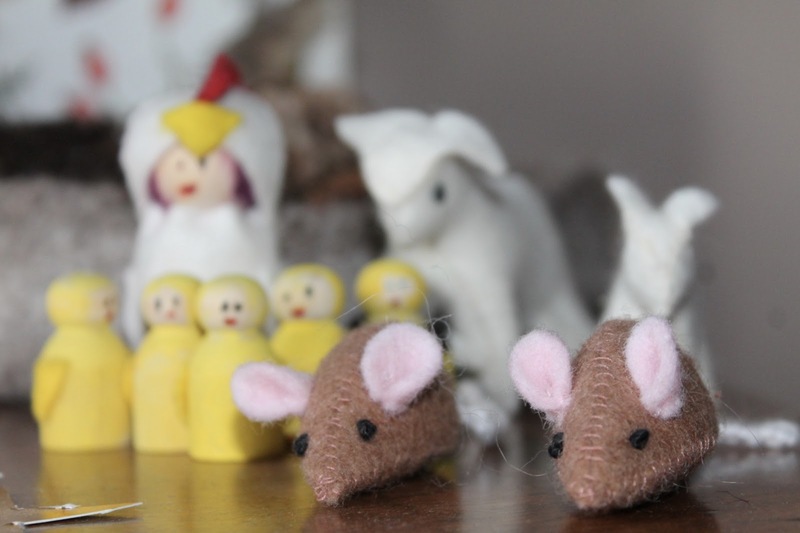 love your wee little mice :) so adorable! It sounds like a wonderful festival! I love your sweet, handmade decorations. Another beautiful tradition, love seeing how you celebrate it. We made an tissue paper angel just like that last week for a friend. Everything looks so beautiful! I absolutely love all of your decorations.